THE COMMISSIONERS - These are the European Members of Parliament who have taken on the responsibility of running the agendas that are designed to help EU member states and the rest of the world. 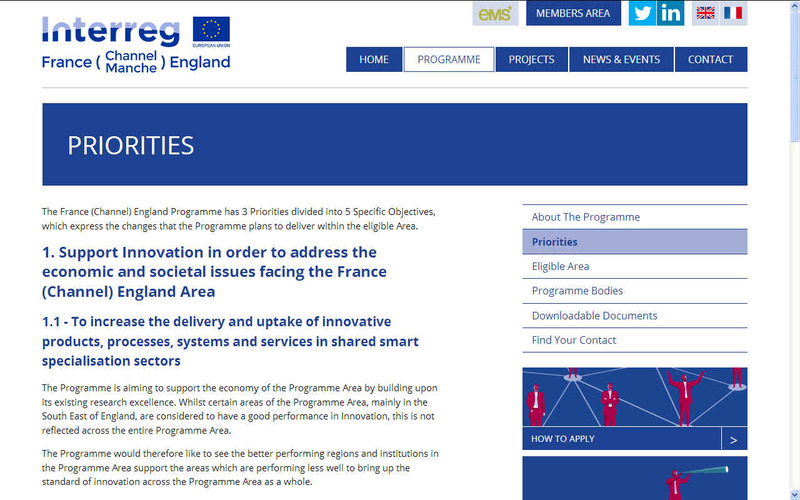 Interreg is the EU’s The France (Channel) England Programme has 3 Priorities divided into 5 Specific Objectives, which express the changes that the Programme plans to deliver within the eligible Area. The Programme is aiming to support the economy of the Programme Area by building upon its existing research excellence. Whilst certain areas of the Programme Area, mainly in the South East of England, are considered to have a good performance in Innovation, this is not reflected across the entire Programme Area. The Programme would therefore like to see the better performing regions and institutions in the Programme Area support the areas which are performing less well to bring up the standard of innovation across the Programme Area as a whole. Additionally, it was recognised in the analysis of the Programme Area that SMEs have a lower than average performance in R&D, and the Programme is aiming to support their involvement in the commercialisation of research in the Programme Area to work towards overcoming this. * Need to enable the active population to play their part in economic revitalisation, including by enhancing skills through innovative training/retraining. The programme will therefore use cross-border cooperation to develop new systems and services to support those furthest from the labour market and the ageing population through social innovation. Social innovation is an opportunity to find solutions to address unemployment, poverty and social exclusion at a cross-border level. This specific objective is aimed at the need to further develop renewable energy sources and energy efficiency in the Programme Area. The focus is on both bringing new products to the market and bringing existing products from the research stage to being rolled out. 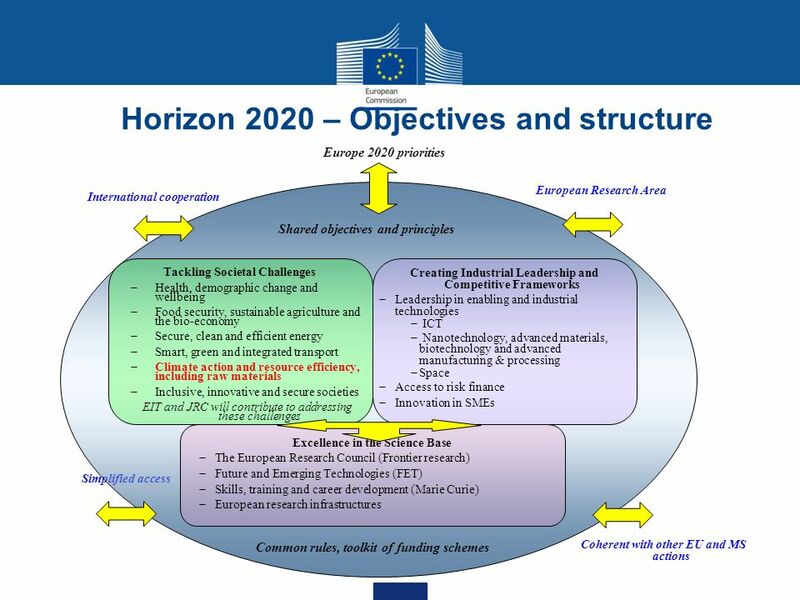 To do this the Programme has a similar approach to Specific Objective 1.1 in that it aims to support research and the commercialisation of research in the Programme Area. At the same time the Programme intends to support organisations to implement and make use of low-carbon technologies and reducing their carbon footprint. This aims to increase demand in the Programme Area for these products whilst at the same time investment in research should increase supply. The focus of this Specific Objective is to develop the economic potential of the Programme’s natural and cultural heritage. By investing in this Specific Objective the Programme aims to improve the economic, environmental and social sustainability of the Programme’s cultural and natural heritage, and to support economic growth through developing a more competitive tourism offer. This has the aim of increasing not only the regions appeal to visitors, but making it a more appealing place to live and work with the intention of attracting businesses and therefore jobs to the area. This Specific Objective is aimed at the protection of the environment and its eco-systems. In particular, the Programme is looking to fund more effective and efficient management of the environment. The aim is to support the people and economy of the Programme Area through the realisation of benefits such as protection against environmental risks (e.g mitigating the impact of climate change), and better public health from a protected environment. This includes management of ecosystem services. Transitional water are bodies of surface water in the vicinity of river mouths which are partly saline in character as a result of their proximity to coastal waters but which are substantially influenced by freshwater flows.